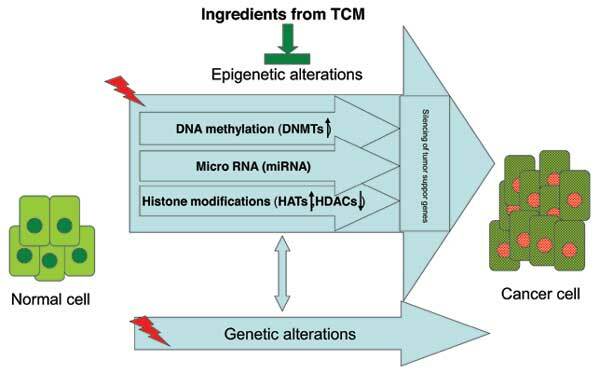 The new term "epivention" refers to epigenetic based cancer chemoprevention targeting epigenetic alterations caused by heritable, but potentially reversible, changes in DNA methylation and chromatin structure. Epigenetic alterations in cancer initiation, promotion, and progression stages, has gained increasing attention. Epigenetic alterations such as DNA methylation, histone modifications and microRNA play an important role in carcinogenesis. Targeting the epigenetic alterations with compounds that regulate DNA methylation, histone modifications, and microRNA profiles in carcinogenesis provides an evolving strategy for cancer chemoprevention. In the review, we focus on the importance of epigenetic mechanisms for gene regulation in cancer chemoprevention and the impact of the ingredients from traditional Chinese medicines that exert epivention effect. Epivention, epigenetic alterations, DNA methylation, histone modifications, Micro RNA, cancer chemoprevention. Nanjing Han & Zaenker Cancer Institute, No. 106 Jiangdongzhong Road, suite B 1306, Nanjing 210019, China.